I know I've already listed this book on my favourite books of the year so far list and I've gushed about it to most everybody since I finished it, but it really must be said again. 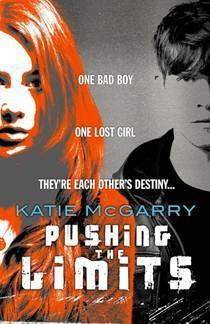 Pushing the Limits by Katie McGarry is a beautiful book, an absolute favourite of mine and one that I cannot recommend enough! This book is so very beautiful emotional and absolutely heartbreaking in its rawness and its honesty. Echo and Noah are such great characters, I found it very easy to fall into their head and into their stories. And in doing so, my heart ached alongside theirs and I became fully immersed into this book. I was bereft when it finished, completely wrung-out with emotion. I do love a good love story, but stories like Echo's and Noah's grab me harder and longer than most because they are characters who are very broken in so many different ways. Echo used to be popular and outgoing with a great boyfriend. But all of that goes away after Echo is the victim of a violent crime that results in her arm covered in scars. But the worst thing is that Echo cannot recall anything about what happened, only that it occurred at the hands of somebody who loved her. I found Echo's journey throughout this book to be painful in so many ways. Her attempts at learning the details of the incident, her PTSD, her troubled mental state are all absolute agony to read at times. But it was also very real and tangible. Together with her physical scars and the loss of her memory, Echo is dealing with the emotional pain of losing her brother in the recent past. All that grief and confusion and pain make Echo a wreck of a character, but one is very sympathetic and somebody that I was rooting for right from the very beginning. And that's just Echo! Pushing the Limits splits the narrative between both Echo's perspective and Noah's. And Noah is dealing with his own hardships. He's not your typical bad boy, Noah. Sure, he's hot and he smokes pot and has plenty of experience with the ladies, but he also just really wants his family back. After his parents died in a fire, Noah and his two younger brothers have all been put in care and Noah is determined to graduate high school and become their legal guardian. But it isn't as simple as that and he's holding onto some serious secrets. They shouldn't work together, this damaged girl and this bad boy. But together, Echo and Noah heat up the pages of this book! The chemistry between them is unbelievable! Really, this book comes so highly recommended from me! It is an incredible book with its emotion and its intensity! Read it, you won't be sorry! Oh totally, I want more from Katie McGarry! Fantastic review. I love the electric atmosphere between Echo and Noah. So, so good! I think I need to get my hands on this now I do love a bad boy, great review Michelle. Thanks :) I really do recommend this book highly!